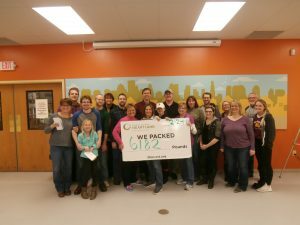 We packed over 6000 pounds of food to be donated across Minnesota! Minnesota Women Lawyers – 100% Club Spotlight on Brown & Carlson! Brown & Carlson, P.A. is pleased to announce that Doug Brown and Jeff Carlson have been recognized as 2017 Minnesota Super Lawyers, and that Eric Hayes and Darren Glur have been recognized as 2017 Minnesota Rising Stars. Congratulations Doug, Jeff, Eric and Darren! Joseph Pope, Law Clerk, was selected to represent the University of St. Thomas School of Law for the 2015-2016 Texas Young Lawyers Association (TYLA) national competition. The TYLA program attracts teams from more than 140 law schools and involves more than 1,000 law students each year. In 2016-2017, Joseph was selected for the University of St. Thomas School of Law’s trial advocacy team to represent the school at the American Association for Justice (AAJ) trial advocacy competition. The goal of both programs is the training and education of law students, providing an opportunity to develop and practice trial advocacy skills in simulated civil and criminal jury cases before members of the Bench and Bar. Congratulations and Good luck Joseph! Jordan Bugella, Law Clerk, was nominated for “best brief” by his professors and selected to be on the University of Minnesota’s ABA Moot Court Competition Team. The team competes against other law schools at a national level in the ABA National Appellate Advocacy Competition (NAAC). The competition involves writing a federal appellate brief and presenting an oral argument in front of a panel made up of practicing attorneys and judges. The first round of the ABA competition takes place in St. Louis, Missouri in February, 2017. We wish Jordan the best of luck in this competition and will keep you posted as to his outcome! A Question & Answer guide to workers’ compensation law for employers in Minnesota. Westfield Insurance presented Carrie Jacobson with its “2015 Blue Ocean OARS Award.” Ms. Jacobson was nominated by Workers’ Compensation Leader Beth O’Connor for her commitment to Westfield’s “Official Active Resolution Strategy.” This strategy promotes creative and accelerated resolution of claims in order to achieve an optimum outcome. Ms. Jacobson was one of only a handful of attorneys selected to receive this award. Congratulations Carrie! The Spaeth Balance Rule and Medicaid: Gist v. Atlas Staffing, Inc.
Medicare “Just Kidding” Language in Stipulations: Is the Joke On Us?